A day of discussion, workshops and talks looking at practical issues of sustainability. 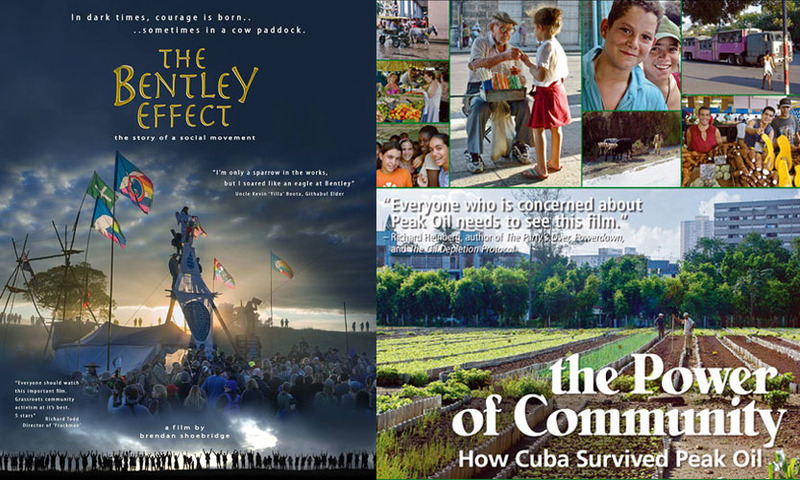 7pm – A double bill of films looking at how two very different communities faced fuel crises. £4 entry – but no-one turned away through lack of funds. When the coal seam gas industry staked a claim on the Northern Rivers shire of Australia, alarm bells rang out. A critical mass of people from all walks of life – farmers, landowners, mums, dads, activists, scientists – organised themselves to rally against the unconventional gas invasion. Despite the enormous public opposition, the gas industry and the State Government were determined to see their gas plan through. A series of dramatic blockades ensued, before the final battle lines were drawn in the peaceful farming valley of Bentley. Thousands of people flocked to the site to stare down the threat of 850 riot police, ordered in to break up the protest. What happened next set an historic precedent. 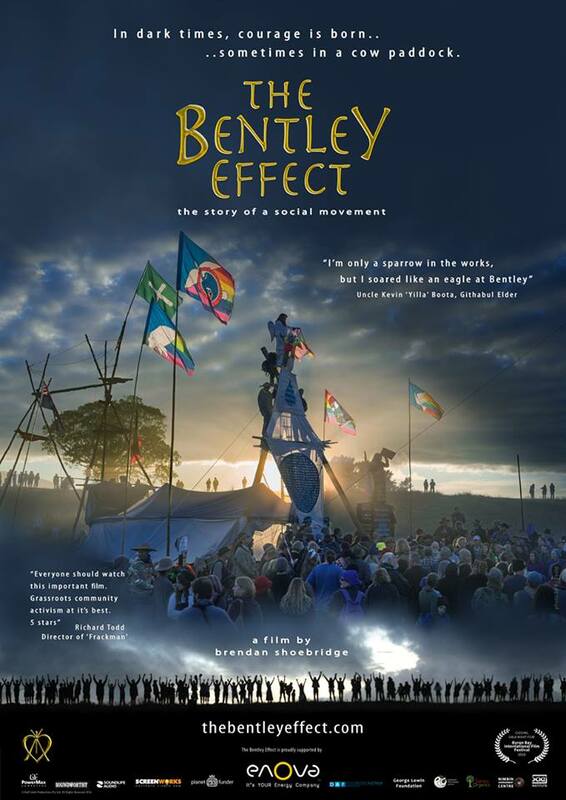 Filmed over five years, The Bentley Effect documents the highs and lows of the battle to keep a unique part of Australia gasfield-free. 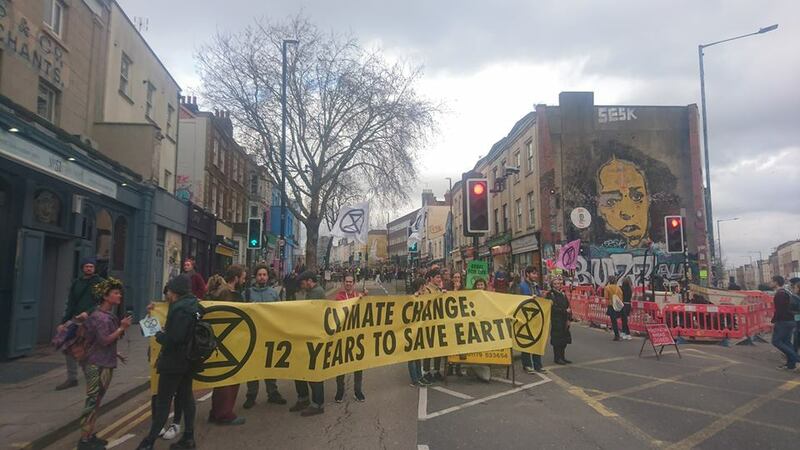 This timely story of a community’s heroic stand shows how strategic direct action and peaceful protest can not only overcome industrial might and political short-sightedness … but it can also be a lot of fun. It celebrates the non-violent ‘Eureka Stockade’ of our time and chronicles one of the fastest growing social movements we have ever witnessed. Gasland showed us the problem – The Bentley Effect points us to the solution and poses the question “what is truly valuable?’. 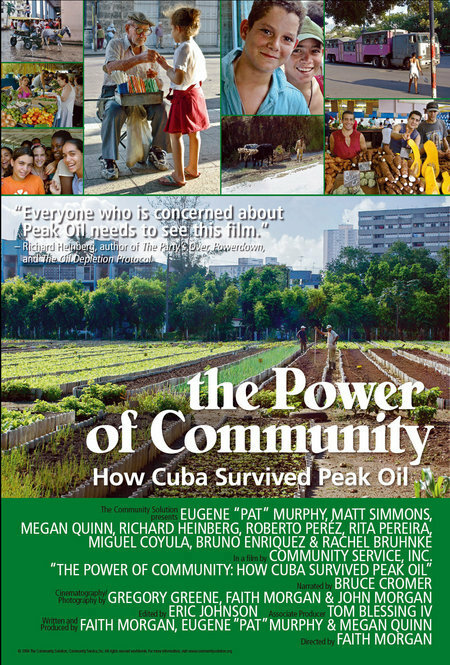 The documentary, “The Power of Community – How Cuba Survived Peak Oil,” was inspired when Faith Morgan and Pat Murphy took a trip to Cuba through Global Exchange in August, 2003. That year Pat had begun studying and speaking about worldwide peak oil production. In May Pat and Faith attended the second meeting of The Association for the Study of Peak Oil and Gas, a European group of oil geologists and scientists, which predicted that mankind was perilously close to having used up half of the world’s oil resources. When they learned that Cuba underwent the loss of over half of its oil imports and survived, after the fall of the Soviet Union in 1990, the couple wanted to see for themselves how Cuba had done this. During their first trip to Cuba, in the summer of 2003, they traveled from Havana to Trinidad and through several other towns on their way back to Havana. They found what Cubans call “The Special Period” astounding and Cuban’s responses very moving. Faith found herself wanting to document on film Cuba’s successes so that what they had done wouldn’t be lost. Both of them wanted to learn more about Cuba’s transition from large farms or plantations and reliance on fossil-fuel-based pesticides and fertilizers, to small organic farms and urban gardens. Cuba was undergoing a transition from a highly industrial society to a sustainable one. Cuba became, for them, a living example of how a country can successfully traverse what we all will have to deal with sooner or later, the reduction and loss of finite fossil fuel resources. The Power of Community was shot during a return trip to Cuba in October 2004. The goals of this film are to give hope to the developed world as it wakes up to the consequences of being hooked on oil. It’s a story of dedication to independence and triumph over adversity, and a story of cooperation and hope. Several Cubans expressed the belief that living on an island, with its natural boundaries, breeds awareness that there are limits to natural resources. Everyone who has worked on the documentary hopes that, seeing this film, people will also see the world on which we live, as another, much larger, island.